Charleston Charlies Band entertain residents at Caeffir Care Home, Llanelli where WPD’s Kathryn Thomas and care home worker Steve Underhill joined in the fun. Care home residents living in West Wales were treated to a special performance from The Oscar Bernhardt’s Charleston Charlies band, thanks to sponsorship from electricity distribution company Western Power Distribution (WPD). WPD working in partnership with Music in Hospitals WPD has supported a series of concerts for older people providing them with live music performances aimed at benefiting their health and well-being. The Manchester based band entertained audiences at locations across West Wales over a three day period - with their clever arrangements which bring new life into the music of the Jazz Age. The free concerts entitled Music and Safety have not only help to increase access to high quality musical performances but also been providing value information to the elderly about how to keep warm and well in the event of a power cut. WPD provided information to residents and their carers about its free Priority Service - aimed at those who may need priority assistance in a power cut. WPD’s Karen Welch explained: “Sometimes power cuts can happen for reasons beyond our control, and we know it can be particularly worrying if you reply on electricity for medical equipment or if you are elderly or disabled. Our Priority Service Register can give customers with specific needs a little extra help when needed”. The concerts have also recieved support from Arts and Business Cymru with its CultureStep programme. - Music in Hospitals (MiH) is a charity with over 65 years’ experience in providing live music concerts to care settings. - MiH organises around 5,000 concerts a year for people of any age receiving care or treatment for an illness or disability. - Around 450 concerts are organised in Wales each year. - MiH works with a variety of organisations including The Alzheimer’s Society, Jersey Arts Centre, BUPA and The Royal British Legion. - Examples of one-off sessions currently offered are: themed reminiscence afternoons in care homes; sing-along sessions at day centres for adults with disabilities; family fun performances at children’s hospices and classical concerts in oncology units for those undergoing treatment for cancer. 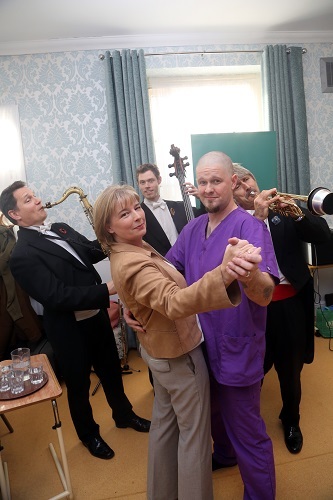 - The patron for Music in Hospitals Wales is world-class soprano Rebecca Evans.